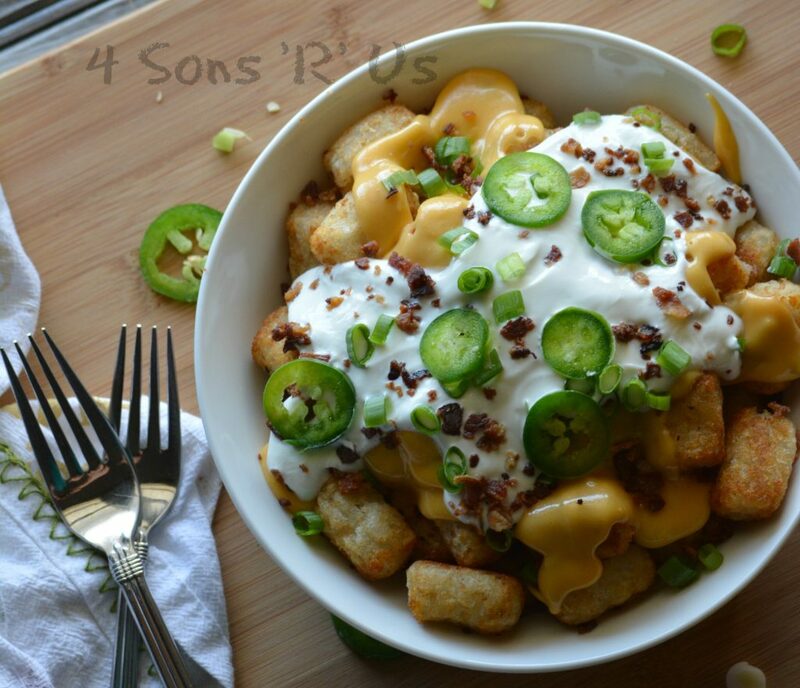 Crispy tater tots in place of nachos. Creamy layers of golden cheese and sour cream mixture. Thinly sliced green onions, crumbled bacon, and jalapenos. 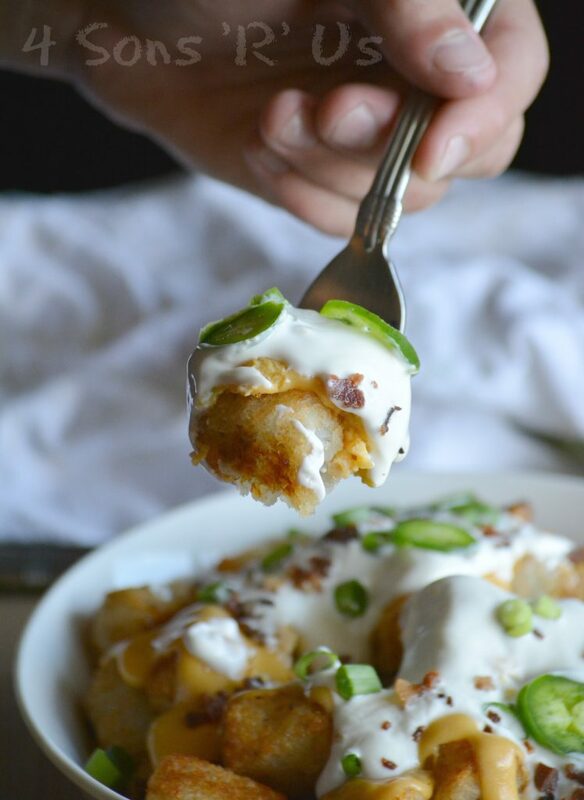 A brand new take on a classic flavor combination, these Jalapeno Popper Totchos are the stuff edible dreams are made of. Have you ever heard an idea and just kind of sat there in silence letting it sink in while you absorb the obvious genius of it? That’s pretty much how I was when I first heard about totchos. Your favorite nacho flavors and toppings, but on topping tater tots instead of nachos? It was like an epiphany and it. was. epic. 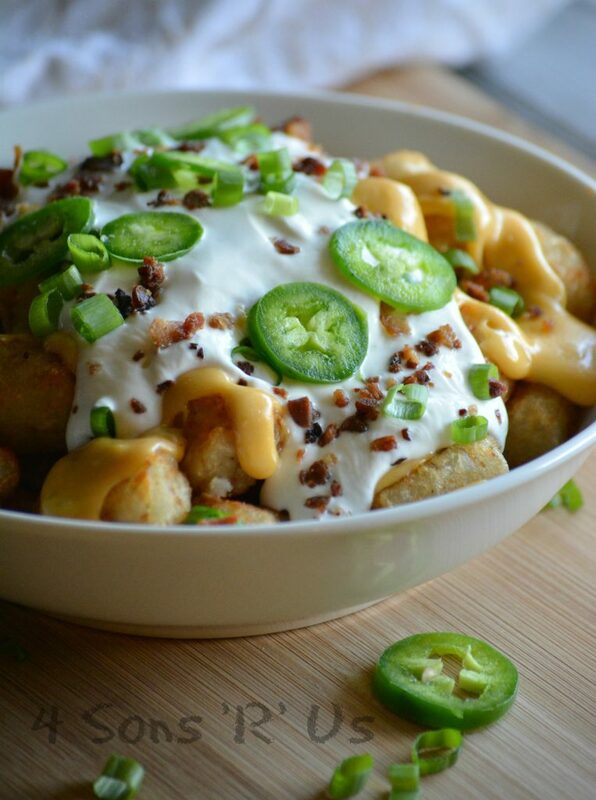 Tater Tots + Nachos = Totchos. Now that’s an equation that made sense to me– where was that in high school algebra?? It fulfilled a taste void I didn’t even know I’d been suffering from. So, so yummy. The kids attacked their plates without a second though going towards table manners or anything. They were solely focused on getting all that edible gold into their hungry little bellies. Even the hubs (who initially sticks his nose up at everything that’s a non-traditional pairing) was shocked when he realized he was stuffed to capacity after a second helping. It’s true comfort food, so it became a special meal we’d have once a month and something we’d all look forward to on game day. While I initially stuck to traditional toppings, we all know it doesn’t take me long to decide to shake things up. Just because grilling season ended, doesn’t mean I’ve retired those flavors for the year. That’s when fun hybrids are born, just like this dish that makes a great appetizer or a filling dinner. 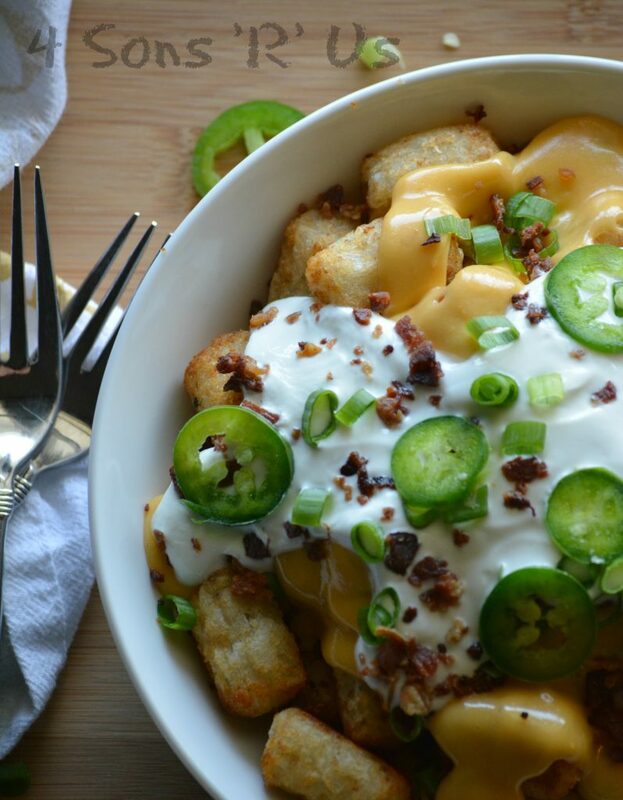 A layer of crisp, browned tater tots are topped with a smooth layer of melted Velveeta cheese. Add to that a creamy (very generous) dollop of sour cream, and top the whole magical meal off by sprinkling green onions and bacon liberally over top. A few jalapeno slices before serving and you’re good to go. No, seriously… grab a plate and get some before it’s too late. 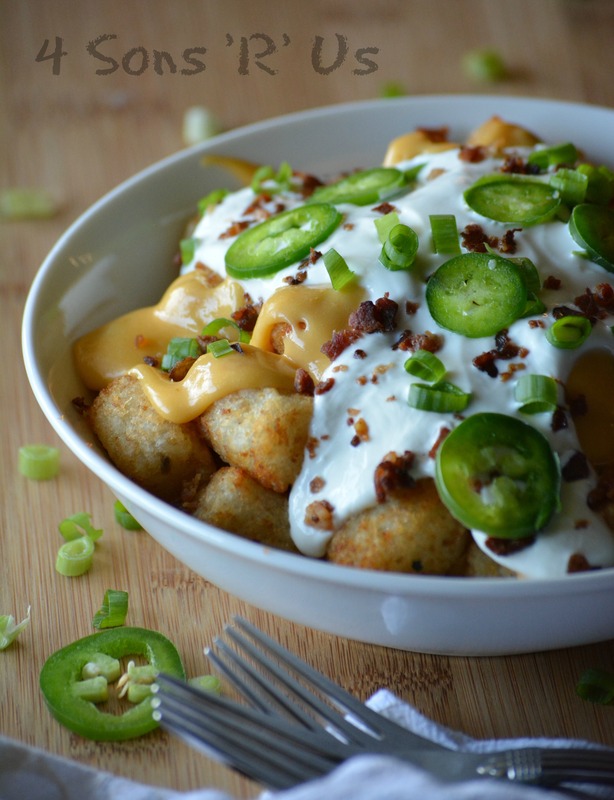 If there’s one thing you can count on– it’s that these Jalapeno Popper Totchos never last long. A fun new way to incorporate the flavors of jalapeno poppers into an indulgent appetizer or main meal. It's a fun new take on comfort food fit for any fun occasion. Spread the tater tots out on a large baking sheet in a single layer, and bake according to the package directions. Set aside. In a small skillet over medium low heat, stir the Velveeta cheese until it's melted and completely smooth. In a separate, small skillet heat the cream cheese over medium low heat, stirring until it's melted and completely smooth. Remove the skillet from heat, let it rest for a minute and then stir in the sour cream until evenly combined. Pour the melted cheese sauce evenly out over the tater tots. Spread the sour cream mixture out over top of the cheese. Sprinkle the green onions and crumbled bacon on next. Finally, top with the sliced jalapeno. Funny, I bought a bag of tater tots for another recipe (which I forgot) so now I have a new recipe to use them. Looks easy and delicious! Yes! This is a much better use of those tots than whatever was originally intended and forgotten. Promise. You made me smile with your “new” math! This looks fantastic. Like the kind of thing I might not tell anyone I was making, lol!! So I wouldn’t have to share with everyone!! Haha, I aim to please.